David Nevin is an American private attorney defending accused 9/11 terror mastermind Khalid Sheikh Mohammed. Human Rights Watch is an international group that has monitored the U.S. government's treatment of accused terrorists held at the Guantanamo Bay military prison, including Mohammed. Journalist/activists Naomi Klein and Chris Hedges have written about the war on terror and have overseas sources as part of their jobs. These key plaintiffs asked the Supreme Court on Monday to allow them to proceed with a lawsuit over the constitutionality of the federal government's sweeping electronic monitoring of targeted foreigners suspected of terrorism or spying. At issue: Can these American plaintiffs who deal with overseas clients and co-workers file suit if they reasonably fear the government was reading and hearing their sensitive communications? The specific question now is whether they have "standing" to challenge the federal law, without a specific showing they have been monitored. 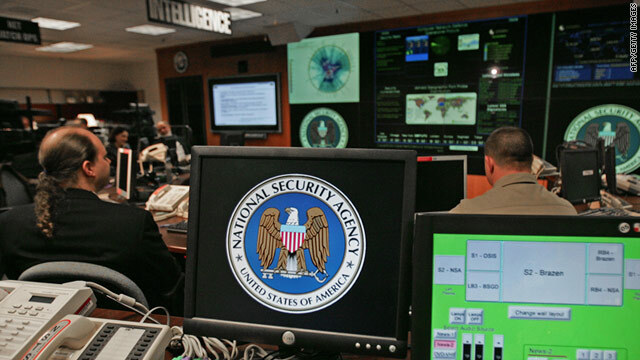 The National Security Agency has in turn refused to disclose specifics, which detractors call "Catch-22" logic. The personal liberty versus national security is one of the biggest cases the high court is addressing this term. The justices appeared divided after a spirited one-hour oral argument. But a majority appeared reluctant to dismiss the lawsuit entirely, as the Obama administration requests. Several justices showed strong sympathy for the plight of the plaintiffs. The court was in session for the morning despite most of the rest of Washington shut down for Hurricane Sandy. Public sessions were canceled Tuesday because of the storm. The rhetorical tempest inside the court pitted two competing narratives - whether a "reckless" federal government was spying on its citizens without check, or whether a politically-driven "fishing expedition" by human rights activists was compromising legitimate national security surveillance of foreign terrorists. The justices wasted little time exploring the privacy limits of the law. Justice Elena Kagan said it more than mere speculation some Americans are being monitored and that they would have to take costly and cumbersome precautions. "Just imagine yourself in this lawyer's position, and the lawyer says - 'I'm representing a person associated with a terrorist organization, I'm representing KLM (Mohammed) in the case of one of these lawyers, and I'm going to be talking to that person's family members and associates and trying to find out everything that I can.' Now, as a lawyer, would you take precautions or would you pick up the phone and start writing e-mails to all those people?" But Justice Antonin Scalia said the Executive Branch deserves a healthy amount of discretion in this area, where courts should not interfere too greatly. "We've had cases in the past where it is clear that nobody would have standing to challenge what is brought before this court," he said. "And we've said that just proves that under our system of separated powers, it is none of our [courts'] business." The Foreign Intelligence Surveillance Act was revised by Congress in 2008 to give the attorney general and the director of national intelligence greater authority to order "mass acquisition" of electronic traffic from suspected foreign terrorists or spies. The law previously required the government to justify a national security interest before any monitoring of phone calls and e-mails originating in another country. A federal judge had to sign any search warrant. The larger issue involves the constitutionality of the federal government's electronic monitoring of targeted foreigners. A federal appeals court in New York ruled against the Obama administration, prompting the current appeal. After such "warrantless wiretapping" was exposed, President W. Bush and his congressional allies moved to amend the existing law, which supporters say is designed to target only foreigners living outside the United States. The American Civil Liberties Union argued in court on Monday that it appears little is known about the FISA Amendments Act, such as who has been targeted, how often it has been used and whether any problems or abuses have occurred. A key point of contention at argument was whether those amendments would stifle free speech of the work of lawyers, journalists and activists– by forcing them to do their jobs less diligently, for fear of being monitored and perhaps prosecuted. Solicitor General Donald Verrilli– speaking for the Justice Department– said to the contrary, if the lawyer "took precautions, it would be because of a belief that [he or she] had to comply with an ethics rule, and the ethics rule would be the cause of [him or her] taking those precautions." Either way he said, there was no "concrete application" of the law permitting someone to come into court and make a claim based on "speculation." "You never know," said Justice Ruth Bader Ginsburg, pointing out the "Catch-22" suggested by the plaintiffs. "There may be dozens of concrete applications affecting the plaintiffs in this case, but we will never know" because of the government's silence. Justice Stephen Breyer pointed out one plaintiff claimed 10,000 overseas phone calls and 20,000 e-mails were subject to direct, secret monitoring. Verrilli suggested the plaintiff could only challenge the application of the law, not whether he or she was personally surveilled. He also said there were existing safeguards in place to prevent government abuse. And Verrilli said there was a "cascade of speculation" about whether there was widespread surveillance in the first place– which he said plaintiffs had no authority to challenge. "He seems very likely to have a concrete injury," said Breyer. "If they [government] aren't wiretapping the people who are described here, who are they wiretapping? And they passed this statute in order to have extra authority." Justice Anthony Kennedy– who could proved the deciding "swing vote"– went further with his skepticism. "You are saying that the government has obtained this extraordinarily wide-reaching power and we have extraordinary risks that face this country and the government's not going to use it. It's hard for me to think that the government isn't using all of the powers at its command under the law - in order to protect this country. And you want to say: 'Oh, well, don't worry that it's not happening. There is another statute.' That's the problem I have with this line of argument." On the other side, Justice Samuel Alito appeared to agree with the government's contention that it cannot be proved the NSA conduct here had either occurred or was "certainly impending"– the traditional legal benchmark to press a standing claim. "If we accepted your other argument, that the plaintiffs have standing because they took preventative measures, wouldn't that undermine completely the 'certainly impending' standard," Alito asked ACLU lawyer Jameel Jaffer. "You have a person who is in a situation where there is a certain risk of the person's conversation being intercepted, but it's not 'certainly impending.' So then the person simply takes some preventative measures," Alito said. A coalition of legal, media, and human rights groups filed suit, many claiming that had been personally and secretly monitored. They worry such electronic dragnets could easily and unknowingly intrude on the privacy rights of all U.S. citizens. The government calls that "speculation" but cites national security in refusing to provide specifics. The justices focused mainly on the "standing" question, and whether the ACLU lawsuit should move ahead. The broader constitutional privacy questions may not be addressed for perhaps another couple of years. The case is Clapper v. Amnesty International USA (11-1025). A ruling is expected by spring 2013. Honestly... What kind of argument is that? We wouldn't do that but we refuse to prove it, believe us you have no case? Sounds a lot more like a no contest plea by Homeland Security. This is one of those cases where there needs to be proof that there isn't warrantless tapping, not that there was. Why not investigate if the Bush Family is funding the Iranian Nuclear Program like they funded the NAZIs? Also investigate the Bush Family for murdering JFK via Hunt under the supervision of GH Bush. Hmmmm........a secret agenda intertwined in things including good and bad policies that can be biasedly manipulated by using the now unnecesary but yet purposefully maintained books of jargons of our old styled Supreme court professionals' is no longer to be entertained here in this era of advanced and rapid information exchange technology. I order to regain our pioneering position in the world stage, 2013's Obamas and Romneys have to start soon working together like a new 3rd party or on a newer friendly platform of contemporary smart and non-violent ideas of all parties to remodel and thereby rebuilding Our Greater Noth-America to emerge as an ever-stronger world leader and a dominating power of economy again. And this time, the approach needs to be truly honest and more humanitarian. The top guys in our territorial Supreme courts hold the keys of the real power of facilitating positive change -which works indirecly just like those of a benevolent-dictators. For a fresh start, if the writings on international credit score board has to be wiped off clean, only a few groups of super wealthy global thugs will have to learn to live like ordinary rich or middle class guys but billions of hard working folks will enjoy the benefit from such positive change.